More than half of winter 2018/19 is through the door. Well, we are more than half way beyond the middle point of meteorological winter (Dec.1- February 29). And what a winter that hasn’t been. Indeed some parts of of inner Portland have not yet seen a dip below freezing. So, what does the rest of winter look like? Long range NOAA forecasts call for warmer and drier than normal for the extended. Remember that we could still have cold weather (below 27ºF) until mid April- so don’t go completely crazy hauling out the tenders. However, we may experience one of our mildest winters ever. The airport has recorded just one night below 30ºF. Our lowest so far has been just 29ºF on New Years morning. If this mild regime continues it could possibly eclipse the incredibly mild 2002/3 winter which saw a minimum of just 27ºF – the mildest winter of the past 40 years. Will it continue? It’s entirely possible. Things could change too. Arctostaphylos bakeri ‘Louis Edmunds’ is a great candidate for winter planting. It’s important to remember that arctic air can spill into our region any time between November 15 and February 15- Arctic air is characterized by lows below 20ºF with high temperatures below freezing. A true zone 8 or lower winter. This happens on average about once every 4 years at PDX. Our last Zone 8 winter was 1016/17- remember that wild Columbia River Gorge winter? And the great freeze of December 2013, or the great Christmas snow of 2008. It’s a pattern. Last winter was mild but with one slightly cold period late, in the third week of February. It snowed and was chilly (Our ultimate PDX low was 21ºF- zone 9a) and caused plants that had not dealt with a freeze all season to be shocked late in the year- Fuchsias froze to the ground, some plants that had broken dormancy were stunned or killed. Again, it was still just a normal zone 9 winter. It was briefly chilly but not arctic cold. But even normal winters can have some tricks up their sleeves. This pattern of 4 years of zone 9 winters and then an arctic event year has been glaringly obvious in weather records for the past 25 years – and is noticed by local climate scientists BUT as of now it has no BASIS in scientific fact. That is there is no cause that can be pinpointed for such a uniform pattern. Most likely it will be something that we look back upon in the future as the beginning of greater climate movement. Or it could fade as a temporary anomaly. But it is conspicuous enough that it should be mentioned and observed for now. We all are familiar with cold hardiness zones, first and last frost dates as a measure of what we plant and when. For instance the Portland Airport which has consistent records there since 1940 is zone 8b (15º to 20ºF). This is calculated in 30 year increments. The last 30 year swath was 1980-2010 and the average annual low for that time frame was 19.8ºF. The average first frost date in autumn is Nov. 28th and the average last freezing date is March 18th. Hillsboro 15 miles away located in the Tualatin Valley and a known colder location is quite a distance from the Gorge and where there is less east wind to stir up arctic air masses and modify the temperatures during those events. The stirring action of wind actually keeps temperatures somewhat warmer. Calm cold nights lead to stratification of the atmosphere. Cold air sinks as long range radiation at the surface radiates heat out to space. This makes that location one of the most consistently coldest readings in the metro area. It also lowers Hillsboro into zone 8a (10º to 15ºF). Hillsboro Airport records an average annual low of 14ºF. Also, two other things happen- the average first frost is much earlier, (October 15 and the last is later April 14) and overall there are many more days below freezing. It’s important to understand your own particular local microclimates. As of today the 28th, the future forecast does not show any arctic air building with a path to us. Once we pass Valentines’s Day the chances of an arctic blast drop some 70% percent. It has only happened a handful of times in the past 120 years. Those are pretty good odds. Meteorologists use many different models that absorb enormous amounts of information and spit out prognostications. It should make sense that the farther out from the forecast date the less accurate will be. A forecast, however, that hits on an anomaly and keeps showing that anomaly in future forecasts gives forecasters pause. For example, if there was a large dome of cold air building over Siberia and model perturbations of the jet stream showed a path to the PNW that would be conspicuous in the forecast by now. We would see something coming. As of right now that isn’ t in the forecast. So mild and bland weather looks likely through the 14th- our safe day. That’s good news. If something changes drastically I’ll happily pop in for an emergency post. Until then, keep your gardeners fingers crossed. This by no means precludes us from getting cold yet again this winter/spring. But it looks like an arctic event is looking less and less likely. We could still get NORMAL cold (above 20ºF) and you should stay aware of that well into true spring. I find planting hardy plants in winter to be one of the great advantages in our climate. Our soil rarely freezes deep (no more than 2″ in an arctic event) and actually warms quite a bit as you dig. A soil thermometer dropped in a 1′ hole will reveal temperatures in the mid to upper 40’s even at our coldest time of the year. That’s warm enough for hardy plants to begin to process and grow. Here is my rule of thumb. If a plant is hardy to zone 7 it may be planted year round in our climate. Zone 8 and warmer plants should be installed in very early spring for the longest possible growing season before the ensuing first winter. Remember that the older and better established a plant is the hardier it is to cold. And this can be quite a difference. An example, in 2013 I had a Grevillea x ‘Canberra Gem’ (Zone 8a)- slightly tender that had been in the ground for two years. I had also just planted a smaller plant in early August. A profound arctic even swept in and dropped the temperature in my garden to 11ºF. The established Grevillea was undamaged while the newly planted shrub was completely, 100% dead. Establishment is everything for borderline hardy plants. For hardy plants, however, now is an excellent time to plant. 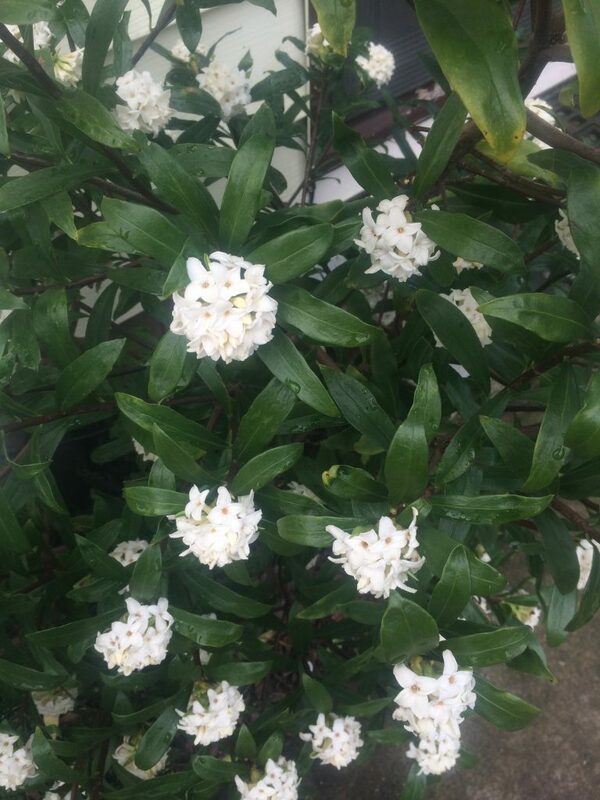 Daphne odora is often planted in winter because that is when it is in bloom. Plants are safer in the ground. Even plants that many consider hardy are actually safer in the ground during a freeze event than they are in pots. Air surrounds pots completely and detaches any of the insulating effects of soil. Pots exposed to severe cold (below 20ºF) are in danger of freezing solid all the way through. Soil becomes concrete and any water absorption ceases. This can damage or destroy roots which may be more tender than the the top growth (Camellias for example) and though the top of the plant may not show obvious damage at first — bark split or even discoloration of the foliage — the roots may be stone dead. When the temperature warms enough for growth to commence, the entire plant collapses. The same plant in the ground is insulated by huge temperature swings by the soil, which roots dislike and unfrozen deeper soil allows the uptake of moisture. The addition of liberal mulch around the root system will further ensure insulation. I’ve planted hardy plants (Zone 7 and lower) in every month of the year and have had excellent results with only minimal losses in extraordinary events. A hardy plant installed in January or February will start acclimating to its new site immediately. You can count on another 4 months of regular rainfall and rising soil temperatures to encourage growth too. Even if we have a dry spring like last year it still affords months of rainfall to establish the plant. AND that means you may not even have to water in the subsequent summer or you can get by on much less. 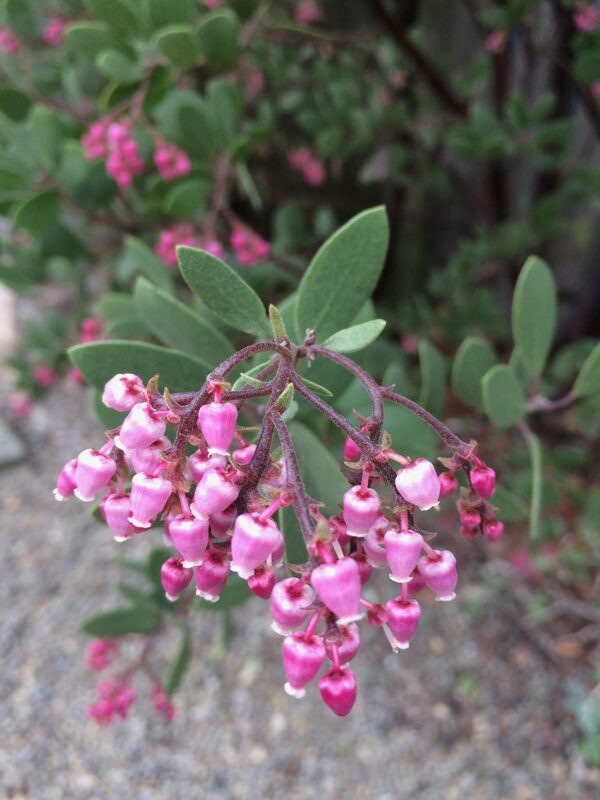 For winter growing shrubs such as Manzanita it’s the ideal time to plant. Make sure to mulch heavily- but not touching the trunk and water it in once lightly to settle out any air pockets. Planting hardy plants in winter puts you way ahead of the game. Take advantage of this mild winter and start gardening now so you have less to do when truly wonderful weather arrives. We’ll be watching the weather and stocking the shop with brand new hardy plants each week. We look forward to seeing you. What do you define as “very early spring” when you talk about planting zone 8 and higher plants? Thanks! Very early spring is in our area Feb.15-April 1st. .